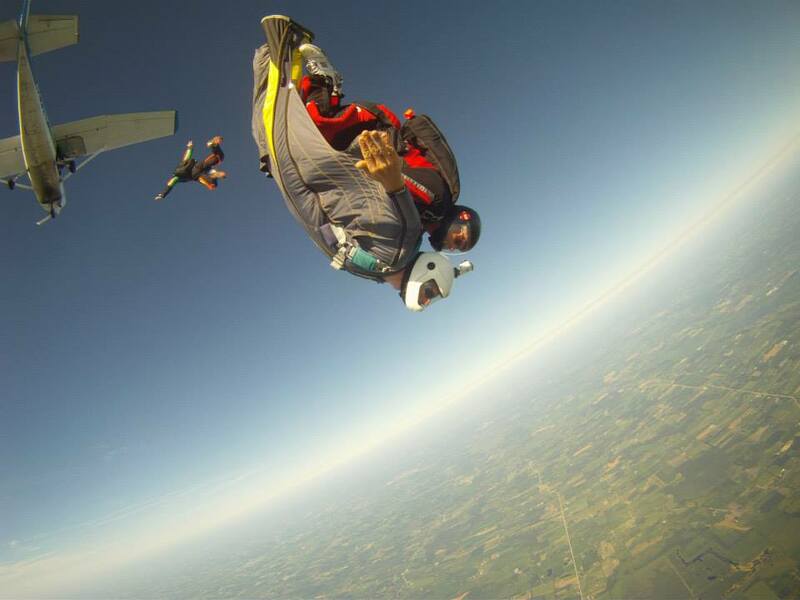 Mark Langenfeld, one of our very favorite WSC community members, made his first jump at our dropzone in August of 2012. His history in the sport, however, goes all the way back to 1969 and the Summer of Love. We love listening to the stories he tells, so we begged him to let us write some of them down. When he finally relented — at the end of a long day renovating his kitchen, no less! — we couldn’t have been more elated. Here’s just some of Mark’s amazing story, in his own words. I can’t remember when I didn’t want to fly airplanes or jump out of airplanes. I always played with model airplanes and hung out at airports… it was just the way I was put together, I guess. I actually managed to solo in an airplane pretty early on. But I was still a kid at the time, and I ran out of money. So, I couldn’t keep going with that just then. About the same time the Ripcord series — which I followed avidly, even though it had really awful scripts — appeared on TV, a dropzone opened three or four miles west of our house. We had an open porch upstairs, so I could watch the skydiving “live” with binoculars from the back of our house. I couldn’t believe my luck. I eventually got over there to observe things more closely, of course. It was an interesting dropzone because it was run by mostly Chicago jumpers, and some of the big names of the time were there: Jim Stoyas, Lowell Bachman (founder of ParaGear), Leon Somers, and just a lot of those big early-1960’s jumpers out of the Chicago area. And they had a Howard DGA-15 as their jumpship, which was big and impressive for the day with a 450-horsepower Pratt & Whitney radial engine hung on the nose. Very cool! That DZ was there for only a couple of years before it moved on, but that was plenty of time for me to watch and get hooked. I used to hang around out there and talk with those guys. I even took a ride on a jump load and hung out the door, taking pictures. I didn’t dare tell my dad about that until almost a year after the fact. willing to train me on static line there, but my parents definitely wouldn’t go for that. So, I had to wait until I turned 21 in 1969. I made my first skydive — or, more accurately, my first parachute jump — on July 12th of that year. Back in the day, the training protocol was to do two “free-ride” static line jumps, followed by three dummy ripcord pulls, followed by your first “hop and pop,” when you’d experience a tiny bit of freefall. (Later, longer freefalls followed in 5 or 10-second increments.) I made those first six jumps at Rainbow Airport, just south of Milwaukee, that summer. And that all went great, even though I was jumping cheap-o surplus rental gear throughout. I was a skinny kid and didn’t weigh anything back then, and I guess I was pretty durable. So, I survived all that and was excited as all get out. At the time, I was an undergrad student at the University of Wisconsin at Madison. There was a jump club affiliated with the University: the Badger Skydivers. I didn’t waste any time joining up and continued my training progression with that club to get my A and B licenses. After about 20 jumps, I scraped up enough cash to buy a well-used ParaCommander [parachute] and my own rig—with a reserve and everything. I jumped with the Badgers (and their DZ affiliate, the Pine River Valley Skydivers) actively until 1973. I helped edit the clubs’ joint newsletter and was elected Badger “prez” for a year or two. Unfortunately, in ’73 — for a number of reasons — the clubs disbanded. We lost access to the airport we were jumping at, and the guy who was regularly flying the jumpship for us moved to a different dropzone. 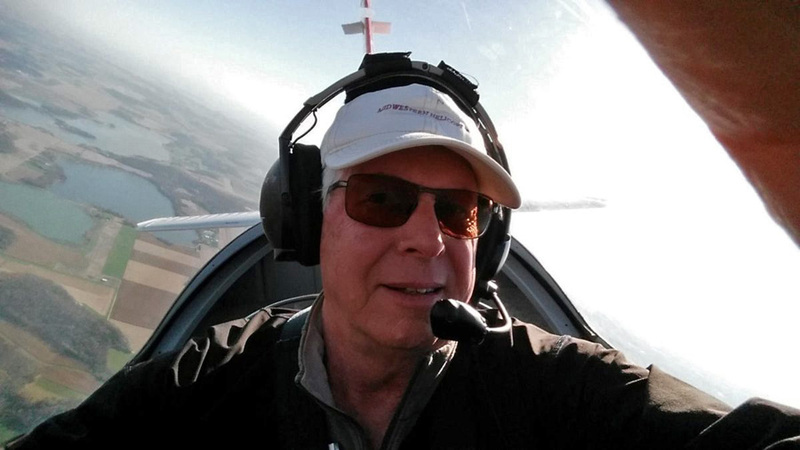 When the club fell apart, I took some lessons, got my Private Pilot-Glider rating, and bought a sailplane – more on that in a minute. I also took up hang-gliding, which was starting to boom right about then. I eventually became Midwest dealer for a couple of the “big” West Coast hang glider manufacturers and did that for a couple years. There were a lot of ugly teething pains in the first years of that sport, but I managed to survive the carnage and have some fun with it. It wasn’t long, though, before I found another dropzone and started jumping again. Back then we used to do our accuracy landings downwind — downwind approaches under round canopies into a big pit of pea gravel. One afternoon – it was an early spring day and the ground was still frozen – I saw that I was high and overshooting the pea gravel, and I sure didn’t want to land downwind on frozen ground. So, I stalled the canopy into the pea gravel. Had I done a PLF, I would have been just fine—but I saw the dead-center [target] disc go by and instinctively reached for it. WHAM! I broke the leg I reached with. Just dumb! The bad luck continued. Because I couldn’t fit in my sailplane cockpit with my leg in plaster, I left it tied out at the airport (also dumb!). A storm came through and ate my brand-new glider along with a couple of other planes – completely chewed it up and spit it out. Never got to fly it; not once. So, that was the end of that for awhile. And then I got involved with a new job assignment and got married, so jumping and flying kind-of fell by the wayside for awhile. Anyway, after getting married and doing other things for a while that didn’t have a whole lot to do with aviation, I started flying airplanes again. I finally got my Private Pilot – Airplane rating and, not long after that, both Lynn and I went back to school: Lynn, to finish her Bachelor’s degree, and me to get a Graduate degree. Of course, becoming a full-time student means instant poverty, so there wasn’t a whole lot of flying of any kind for me during that period. 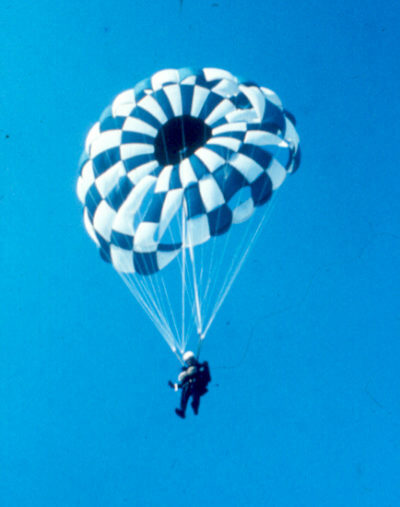 In the early 1980s, the subject of skydiving came up again. Some friends wanted to try the then brand-new Accelerated Freefall (AFF) training, and I helped them make connections with a Chicago-area DZ where AFF had just become available. Lynn said, “You know, I never got to make my jump.” At the time we were doing some scuba diving, too, so we loaded up the car with our scuba gear and headed for Florida on spring break. We did a little scuba diving in the freshwater springs, and then went over to Skydive Deland for Lynn to do an AFF jump. 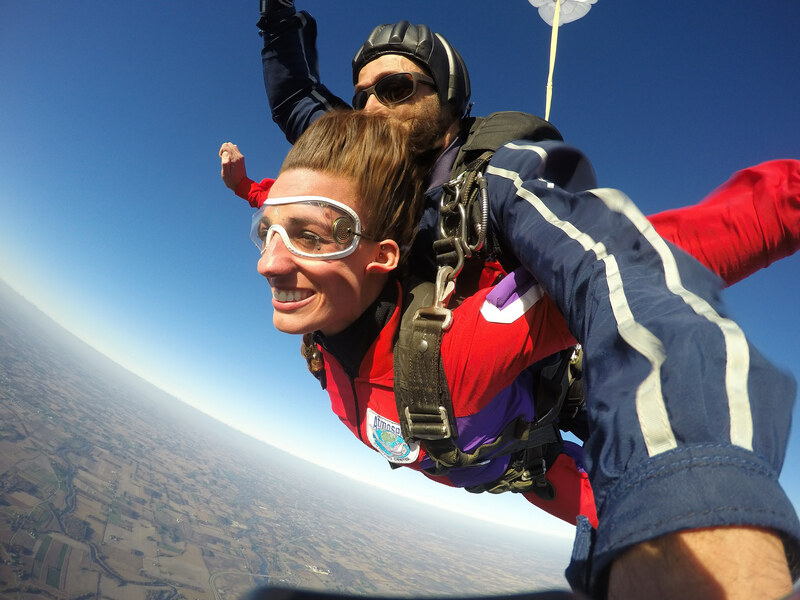 We figured that, if it might be her one-and-only jump, it would at least be a genuine skydive. That was January of 1984. She had a great AFF jump – her instructors were two of the best: Tom Piras and Bob Hallett. I was sitting there kinda twiddling my thumbs. By then it had been ten years since I’d last jumped. Bob Hallett came over and told me I ought to “get up there.” I said, “It’s been 10 years.” And he said, “No problem! We’ll just do a ‘Level 6’ AFF jump with you. You ever jumped a square?” I said, “No.” And they said “No problem! We’ll put you in a suspended harness and we’ll get you ready.” And I thought: Alright, what the heck. 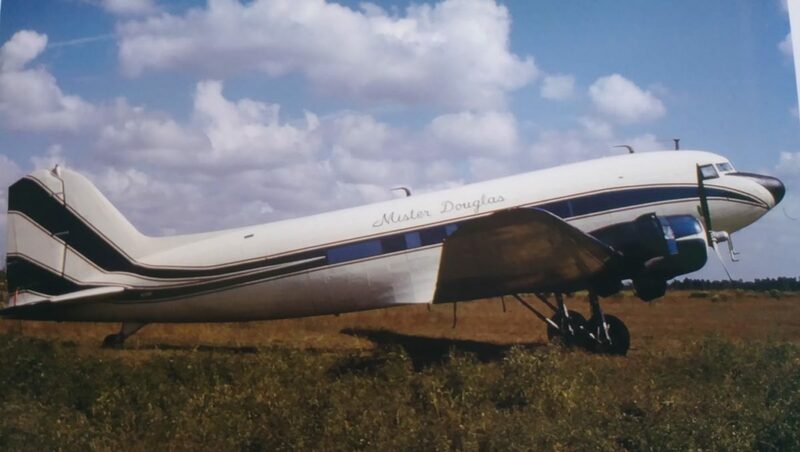 So I went up on a DC-3 load — in “Mr. Douglas”— with Rocky Evans. If that name doesn’t mean anything to you, it should. He was one of the AFF pioneers. Anyway, Rocky and I got out of the airplane at 14 grand, turned a couple of two-way points and it all came back “no problem,” just as promised. I’d never jumped a square before, but — having flown hang-gliders — I didn’t have any trouble flying it. And Rocky signed my logbook saying, “You’re good to go! Do anything you want.” Of course, Lynn and I were both totally stoked but, being full-time students, we didn’t have any money. So, we sadly concluded it was impossible to continue jumping at that time. I got my law degree in 1985 and, after a court clerkship, started practicing law in ’86. As time went on, I started flying airplanes again for both business and fun. So, I got my complex, instrument and sailplane ratings, and I was flying quite a bit. It wasn’t just the airplanes, either; I picked up hang gliding again, and Lynn and I got real active with hot air balloons— mostly officiating at competitive events. We even had and flew our own hot air balloon for awhile in the early 1990s. About that same time, I got a great chance to get another sailplane. A friend of mine was moving to California and was selling his glider. 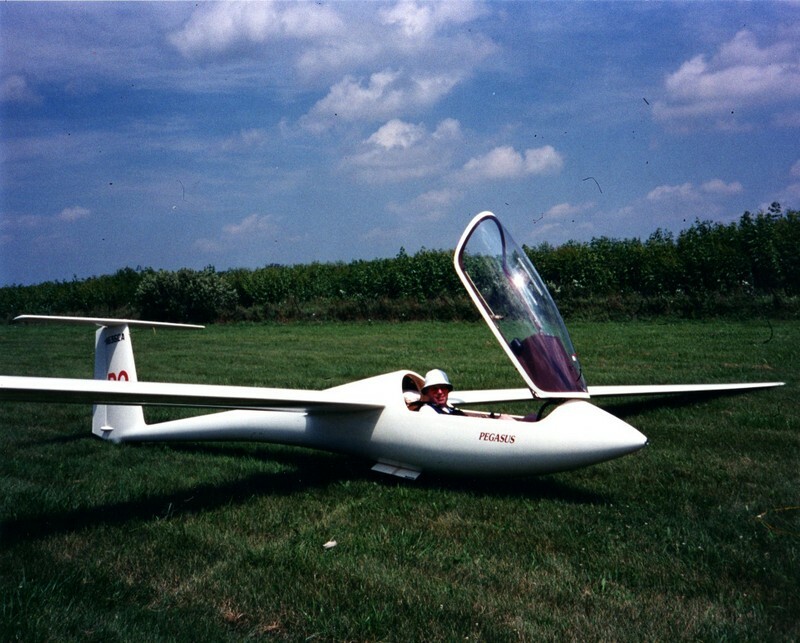 So, I bought it from him: a Centrair Pegasus, a French-built, 15-meter fiberglass racing sailplane. I flew it avidly for — golly — fifteen years, I guess. It was a beautiful flying machine! It was through sailplanes that skydiving came back into my life. I always flew that particular sailplane while wearing an emergency parachute. Most of us that flew high-performance sailplanes wore an emergency parachute: not because sailplanes are particularly dangerous, but because a lot of the time you end up sharing thermals circling together with multiple sailplanes – and, while mid-air collisions aren’t common, they’re not unheard of either. In some situations, you want to have the option to jettison the glider and turn it over to the insurance company. One day, I was getting ready to go flying. I slung my parachute over my shoulder and Lynn looked at me and said, “If you ever had to use that thing, would you survive the bailout?” And I got to thinking about that. It had been a long time since I’d used a parachute. I got to talking with the other glider pilots at the airport where we flew. A lot of them wore parachutes, too. And I said, “Have you guys ever made an intentional parachute jump? Do you know what it’s like?” And not one of them had or did. That resonated. We got a group of five for six of us together, and I started nosing around a little bit at the various nearby dropzones. WSC gave me the best vibe, by far. Actually, it wasn’t the first time I’d been there. One of the guys I practiced law with had done some legal work for Bo and Alex some years before that. He and I got to talking parachuting one day and he said, “You really need to go visit these guys! They’re really nice people.” Lynn and I had stopped in one Sunday afternoon, and they were indeed very cordial and welcoming. I remembered that. So the other glider pilots and I went down there to WSC. All of us did a tandem. Lynn made a tandem, too, even though she doesn’t fly gliders; she just wanted to jump again. We all had a fine time and learned a lot. Everybody that jumped said they were glad they did. Well, when I came home, I was buzzed – there was this noisy bug in my brain. It wouldn’t let me alone, so I decided to go talk to Bo about maybe doing an AFF jump – doing it myself again. I knew it might be a problem that I was an older guy, but I also knew that Bo would be straight with me and tell me what I needed to know. So I went down there and talked with Bo. He said, “Yeah, of course, you can jump again! But I want you to make that jump with me.” I said, “It would be a privilege.” We set things up for about a week down the calendar. We did a ground refresher, went through all the drills, and then up to 12,000 feet we went. We left the plane and Bo released his grip almost right away while we were still “on the hill.” He orbited around in front of me and gave me two thumbs-up and I gave him thumbs-up back. And, you know, I wobbled around a little bit, but it sure felt good to be back. Everything went fine. I deployed the main at prescribed altitude, came down to the landing zone, did a stand-up and thought “Yeah!”. I was hooked again. I got signed off for solo then and there, made a few more “student” jumps, bought a rig, and the rest is essentially history. I started exploring 21st-century skydiving: rediscovering what hasn’t changed, and learning what’s new. Mark jumping on the back of a wingsuit skydiver! Overall, the sport is just way more sophisticated and a lot safer than it used to be. Modern gear is far more user-friendly than the stuff we used to jump back when I started. It’s half the weight and half the bulk. The standard for individual performance is so much higher. AAD’s are the norm. Cutaways are infrequent, but when they happen, they’re neat and clean as compared to what we used to have to deal with. Reserves are way better, too — you can actually fly them back. I turn 70 years in June. Back in the day, it was rare to see a 50-year-old jumper. Now there are hundreds of active jumpers in their 60s, quite a few in their 70s, and even some in their 80s. I definitely don’t jump at the pace I used to. (In fact, last year — due to a whole bunch of unforeseen circumstances — I didn’t get to jump at all.) But, hey, that’s OK. I am now and always will be a skydiver. There’s this irreverent social group called SRA (Skydiver Resurrection Award) composed of hundreds of skydivers who have started jumping again after having been out of the sport for at least ten years. Tim Long, who is one of the group’s head honchos, teased me when I joined saying that, because I had TWO qualifying ten-year gaps on my “resume’,” I must be “either really forgetful or really stupid.” While I guess I’m probably a little of both, there’s also some comfort in knowing that there are at least 20 other SRA members who have done the same thing. And I guess it all means it’s rarely too late to skydive nowadays. Thus, I think today’s sport is definitely suitable for a person either who’s been out of jumping for a while to restart — or for an older person that maybe has never done it, but decides they want to jump, to go do it. Skydiving is not for everybody, certainly. You’ve got to be reasonably healthy and you’ve got to be reasonably fit. But if you meet those parameters and you’ve got the inclination, I think you should go for it. No question about it. There’s no reason not to. I have been so very fortunate to be able to realize my childhood flying dreams in these ways. And there have been so many really great and generous people in the flying and jumping communities who have helped me so much along the way. I am just a very, very lucky guy.